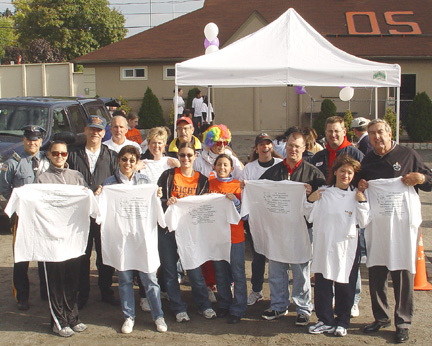 Euclid Lodge #136, Free and Accepted Masons of NJ sponsored a 5k (3.1 miles) walk on Saturday October 16, 2004 at Depken Field (Franklin & Route 17) starting at 10:30 a.m.. to benefit dyslexic children. An estimated 200 participated. This is the first year the Hasbrouck Heights Masons have sponsored this regional walk, which also took place this October in more than 40 cities and towns throughout 15 states, raising funds to support the tutoring services children need to overcome dyslexia -- money to help dyslexic children learn to read and write. Wearing bright orange "T" shirts, Heights Key Club helped during the event. Local sponsors included: Costa Memorial Home, Minuteman Press, Gateway Raltors, Thrivent Financial for Lutherans. Imagine what your life would be like if you couldn't read. You'd be missing out on life's most fundamental gifts. If you couldn't read, your innate curiosity would turn to frustration and anger-a bad combination of feelings. Children born with a neurological disorder called dyslexia struggle with these feelings every day. Through no fault of their own, they are faced with reading and writing roadblocks that have seemed insurmountable. Until now. Dyslexia is, however, a treatable condition. Children with dyslexia need professional help, and the earlier they receive it, the greater their chances of achieving normal, fully functional lives. The program offered at the 32° Masonic Learning Centers for Children, Inc. offers the most effective treatment of its kind in battling this reading disorder. No one else in the nation has a program remotely like it, with one-on-one, professional tutoring offered to children at no charge to them or their families. Dyslexia is an inherited neurological disorder that affects the way people learn to read and speak as well as how they process things mathematically. Some of the world's most famous artists, innovators and leaders were and are dyslexic, including Leonardo da Vinci, Albert Einstein, Thomas Edison, Agatha Christie, William Hewlitt, Winston Churchill, Tom Cruise, Cher, Jay Leno, and Charles Schwab. 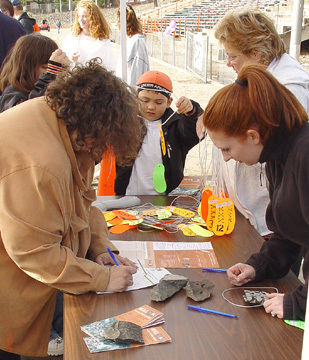 Upon signing in, participants received their "foot", which was marked by volunteers at each turn around Depken Field. Heights Key Club helps with the start. 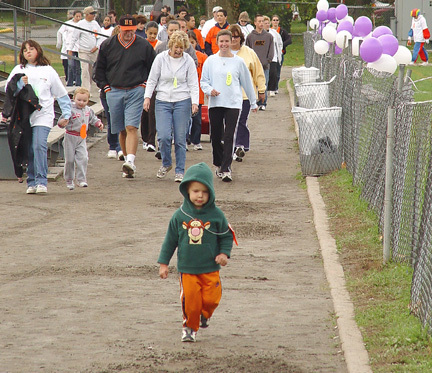 Event orgainzers for the Hasbrouck Height's first "WALK to Help Dyslexic Children"